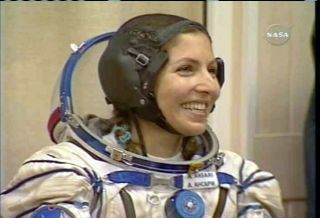 The world's first female space tourist, Anousheh Ansari, was all smiles in the hours before the flight as she said farewell to family and well wishers. This story was updated at 2:17 a.m. EDT. A Russian rocket launched the world's fourth space tourist and two astronauts into orbit early Monday morning on a two-day trip bound for the International Space Station (ISS). The Soyuz TMA-9 spacecraft blasted off from its launchpad at the Baikonur Cosmodrome in Kazakhstan at 12:09 a.m. EDT (0409 GMT), carrying ISS Expedition 14 commander Michael Lopez-Alegria, flight engineer Mikhail Tyurin and Anousheh Ansari-the world's first female space tourist. During the launch, Tyurin sat in the middle of spacecraft and served as Soyuz commander. For his call sign, Tyurin chose "Vostok," the Russian word for east and the name of the vehicle that carried Soviet Cosmonaut Yuri Gagarin into orbit more than 45 years ago to become the first human in space. Tyurin was flanked on his right by Ansari and on his left by Lopez-Alegria, who served as ascent flight engineer during the launch. About nine minutes after liftoff, the spacecraft safely reached orbit and a tiny stuffed bear inside the capsule floated in its new microgravity environment. The Soyuz spacecraft will fire its engines three additional times over the next three days to put it in the same orbit as the space station. Docking with the orbital laboratory is scheduled for 1:24 a.m. EDT (0524 GMT) on Sept. 20. The three Soyuz crewmembers will be met by Expedition 13 flight engineer and European Space Agency astronaut Thomas Reiter, who will remain aboard the station and join the Expedition 14 crew. Expedition 14 will mark the first time there has been a three-person crew on board the space station from start to finish of a mission since the tragic loss of Columbia in 2003. Lopez-Alegria and Tyurin will relieve Expedition 13 Commander Pavel Vinogradov and NASA Science Officer Jeff Williams, both of whom have been aboard the ISS for six months. Ansari is paying an estimated $20 million to visit the orbital laboratory in a deal brokered by the Virginia-based space tourism firm Space Adventures and the Russian Federal Space Agency. Space Adventures also arranged the ISS flights of Dennis Tito in 2001, Mark Shuttleworth in 2002 and Greg Olsen last year. Ansari will remain aboard the station for eight day, during which time she is scheduled to perform a series of scientific experiments on behalf of the European Space Agency. Ansari will return to Earth with Vinogradov and Williams on Sept. 28. Before the launch, Ansari wrote in her blog that she felt a mixture of excitement and anxiety about her trip. "Strangely enough, my anxiety is for those who await me here on Earth," she wrote. "My family...I know how hard this must on them. I just want to get the launch behind me and start floating in the wonderful weightless of space." The Expedition 14 crew's busy schedule will include up to four spacewalks-three in late January in U.S. spacesuits and another in Russian Orlan spacesuits-the rewiring of the ISS power and cooling systems and activation of the new solar array brought up by Atlantis on STS-115. "It's one thing to learn something on the ground, and it's different to have to find something to work with in real life," said Tyurin about the crew's challenging schedule in a preflight interview. "It's the same thing as reading a book and obtaining your own experience." In December, NASA space shuttle Discovery is scheduled to ferry Expedition 14's final crewmember, Astronaut Sunita "Sunny" Williams, to the station as part of STS-116. Williams will relieve Reiter, who will return to Earth with Discovery.